This collection contains a set of 96 standardized and characterized parts that can be used for bottom-up hierarchical assembly of single and multi-gene constructs for S. cerevisiae expression. This kit adapts the MoClo stategy for assembly (but may not be compatible with other MoClo kits), and includes an assortment of parts (promoters, terminators, peptide tags, selection cassettes, etc). A Highly-characterized Yeast Toolkit for Modular, Multi-part Assembly. Lee ME, DeLoache, WC A, Cervantes B, Dueber, JE. ACS Synthetic Biology 2015 DOI: 10.1021/sb500366v. Journal . This collection contains a set of 96 standardized and characterized parts that can be used for bottom-up hierarchical assembly of single and multi-gene constructs for S. cerevisiae expression. The toolkit was deposited by John Dueber’s lab and contains characterized promoters, terminators, peptide tags, copy number machinery, and genome-editing tools. The hierarchical assembly scheme is based on the Golden Gate cloning technique, but it is also designed to be compatible with recombination based cloning such as yeast in vivo assembly, ligation independent cloning (SLIC) or Gibson Assembly. The design specifications of this collection also make constructs BioBrick-compatible. Use of this workflow allows for construction of multi-gene plasmids from PCR templates in three days. Note from the depositor: We have noticed that some of the constructs are mildly toxic to E.coli (particularly those expressing fluorescent proteins), and will disappear from the population if a culture is passaged multiple times. The wells where we have noticed this issue are the following: A1, D11, E2, G11, G12, H1, H5, H6, H7, H11, H12. We suggest these be streaked onto solid media to pick fresh colonies every time. Conveniently, the fluorescent proteins themselves make it very easy to identify correct clones. Wells A1, D11, E2, H11, and H12 are green, while G11, G12, H1, H5, H6, H7 are red. 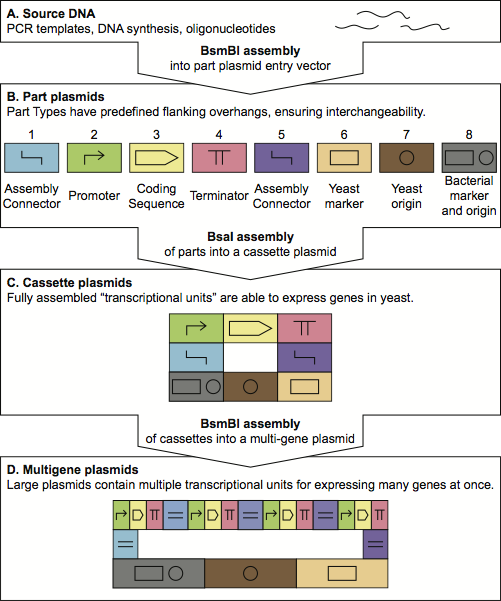 A Highly-characterized Yeast Toolkit for Modular, Multi-part Assembly. Lee ME, DeLoache, WC A, Cervantes B, Dueber, JE. ACS Synthetic Biology 2015. DOI: 10.1021/sb500366v. Journal .